An easy-to-understand approach. 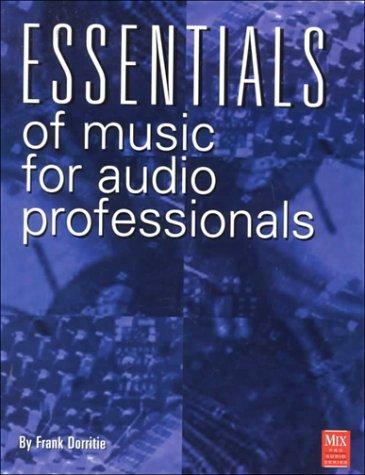 Includes CD. 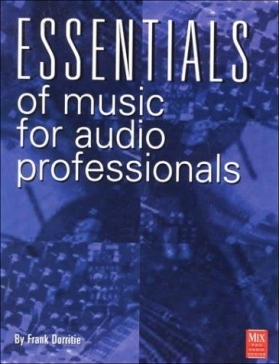 "Essentials of Music for Audio Professionals" is considered the standard text in its field. Frank Dorritie is a performer, producer, arranger, educator and author. He is known for his work with Dave Brubeck, Wynton Marsalis, the National Cast of Phantom of the Opera and Tito Puente, among others. Nine of his recordings have received Grammy nominations and two of these, "New York Scene" (Art Blakey) and "La Onda Va Bien" (Cal Tjader), won Grammy Awards in Jazz and Latin categories, respectively. Frank pioneered the application of the highest possible recording techniques to the Drum and Bugle Corps activity with The Blue Devils and Santa Clara Vanguard in the 1980 release, State of the Art. His work in this area has continued through the decades, including volume two of State of the Art in 2000, Drum Corps International's 2004 Tour of Champions, and multiple 5.1 Surround Sound recordings with The Blue Devils, Santa Clara Vanguard, Cavaliers, and Glassmen, among others. Frank has instructed and/or arranged music for The Blue Devils, Santa Clara Vanguard, Cavaliers, Madison Scouts, Garfield Cadets, Bluecoats, Bridgemen, 27th Lancers, Renegades and a host of other corps and bands. He has worked as a performer, clinician and adjudicator throughout North America, Europe, South Africa and Japan, and has served as musical consultant for Fox Television.